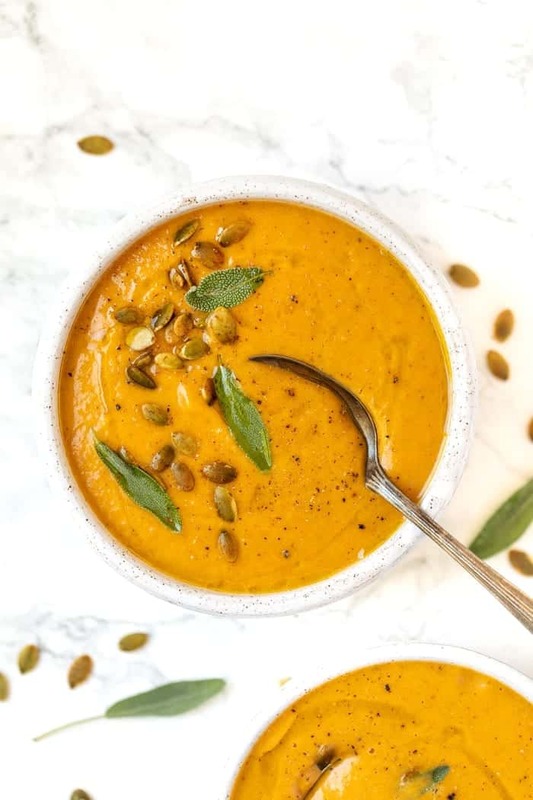 This roasted pumpkin soup is perfect for fall! With a hint of chili, lime and coconut, it's flavorful and unique. Naturally gluten-free & vegan too! One of the things I've been loving lately is digging through the archives of the site and finding recipes from my first year or two of blogging that need a little update. Since there are now over 700 recipes on the site (!! ), I tend to forget the ones that were shared in the early years. When I find them, it not only shows me how much I've grown in the photography department but also how my style of cooking has changed. I'm much more confident with my flavors. I rely less on premade flour mixes and canned ingredients. And now that I'm mostly plant-based, I've found new ways to make things feel like they're full of dairy, when in reality they're totally vegan. And that's exactly what we're doing today! 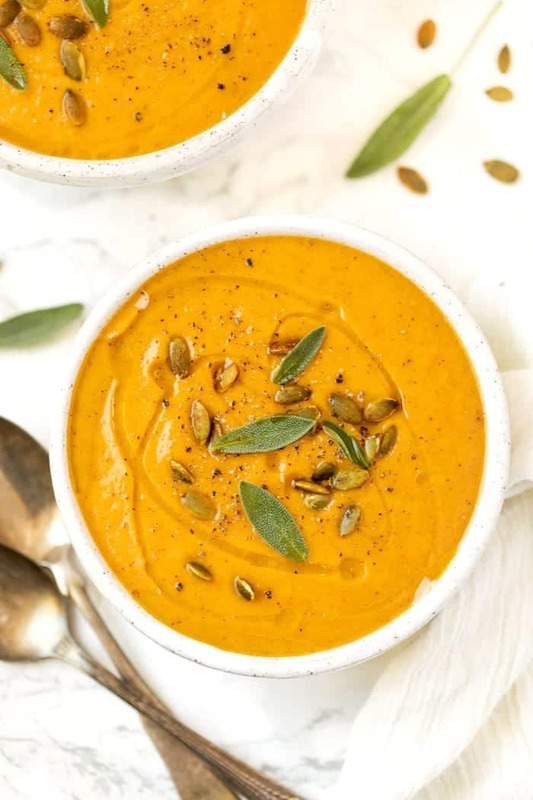 This roasted pumpkin soup is a perfect example. The original recipe called for canned pumpkin and sauteed onions, but since we're in the midst of fall and approaching Thanksgiving, sugar pumpkins are plentiful in the grocery store! So rather than scoop out pre-cooked pumpkin puree, we're roasting a pumpkin from scratch, along with an onion and some carrots. It adds tons of flavor, doesn't add that much work and turns a good recipe into a GREAT recipe! The best part of all? Everything is blended up in a blender so clean up is a dream. 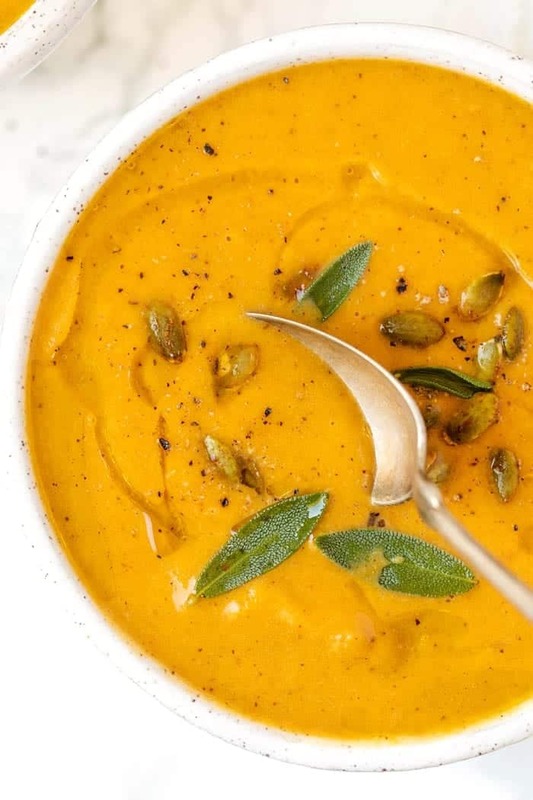 When you're making a vegan creamy soup, the real trick is your blender. In order to get that velvety smooth texture, you really need one that has the power to break everything down. 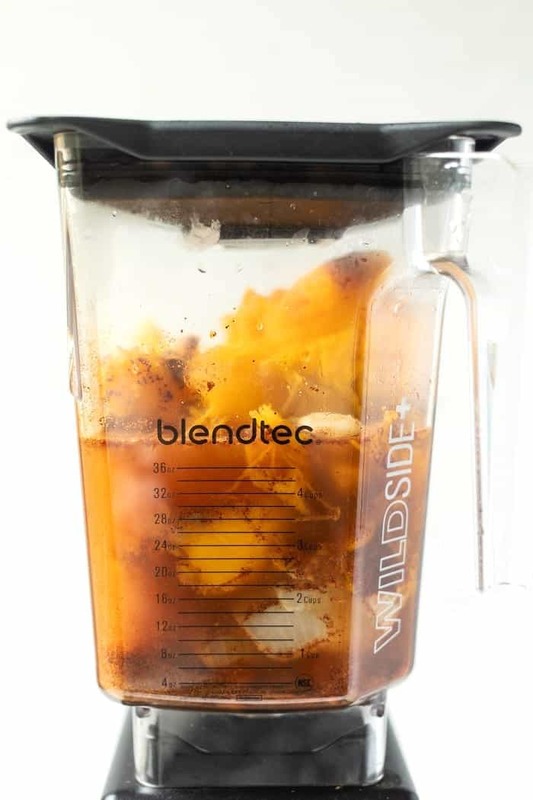 I love my Blendtec, but I also recently invested in a Vitamix and I gotta say, for soup, the Vitamix has the edge. You're seeing the Blendtec in these photos because I made this at my parent's house, and they both work really, really well, I just prefer the texture from the Vitamix. Do you need a high powered blender? My short answer is yes. 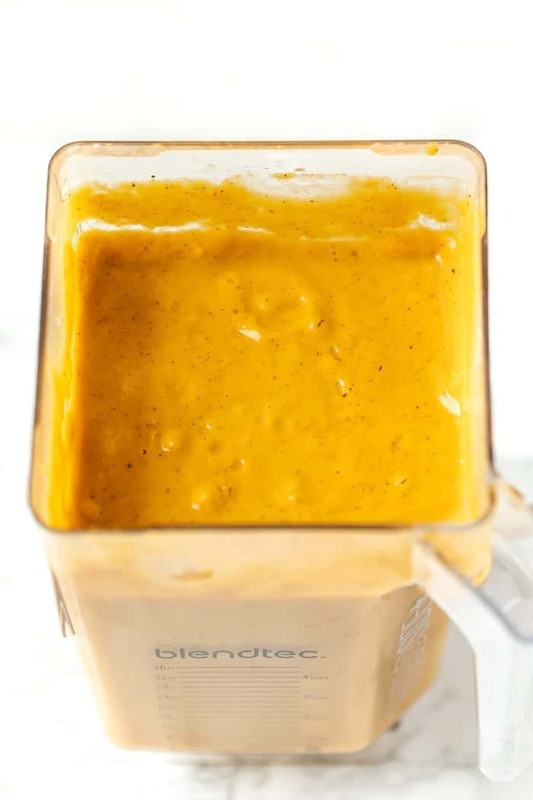 BUT if you don't have one or you aren't ready to invest, you can probably use a regular blender but will need to puree the soup in batches. It will take longer and you likely won't get it quite as smooth, but it should still work. 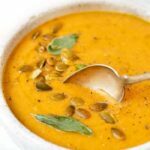 Now the trick to making vegan soups taste creamy is to use a full-fat non-dairy milk. You can either use coconut milk (which we're doing here) OR you can use cashew cream (like we did in this vegan white quinoa chili). Coconut milk will give you that coconut flavor, whereas cashew cream is pretty flavorless and is therefore a bit more flexible. 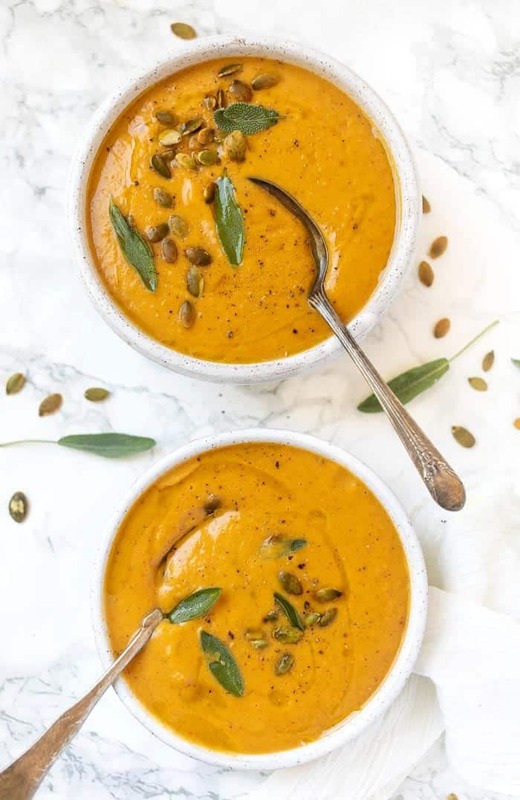 I wanted to give this roasted pumpkin soup a coconut-y flavor, so I opted for that, but you could totally make do with cashew cream. I'd say add about 1 1/2 – 2 cups of cream to replace the coconut milk. And if you don't have any of those full-fat options, you can use an unsweetened plant-milk as well it just won't have quite as much flavor! And finally, let's talk about the pumpkin itself! I wanted to make sure this soup was really robust in flavor which is why I personally opted for roasting an entire pumpkin. If you've never roasted pumpkin before, it's super simple. You just cut the pumpkin in half, scoop out the seeds, place it on a baking sheet and roast it for about 50 – 60 minutes. And the beauty of doing that is that you can also just toss your carrots and onion on the pan and roast those right alongside the pumpkin! If you don't have access to fresh pumpkin, you can certainly use canned. I would recommend using an entire can (maybe 1.5) and just sauteeing the other veggies. It will still taste good, you just won't get that underlying roasted flavor you'd get from the fresh option. Preheat the oven to 400ºF. Half and clean the pumpkin and add it face up to a baking sheet. Add the carrots and onion to the pan as well. Drizzle with olive oil and season with salt and pepper. Bake on the center rack for 45 - 50 minutes until the pumpkin is tender. When there is 10 minutes left in the baking, place the garlic on the pan and continue cooking. After everything has roasted and cooled slightly, transfer the veggies and garlic to a blender. Scoop the flesh out of the pumpkin and add that to the blender as well. Toss in spices, broth and lime, and blend on high until smooth and creamy. Once smooth, add the coconut milk and blend again until creamy. Taste and adjust seasoning as needed. Serve immediately (if it's warm enough) or transfer to a pan and heat to before you serve. Garnish with a drizzle of oil, pumpkin seeds and some sage leaf if desired. I love this recipe. I have made it the normal way with pumpkin and then with other kinds of squash like butternut.it turns out grate every time!!! I lo e this one!! I tried this for my lunch I took to work it was SO GOOD!!!! I had it every day for a week! I went and got a lot of pumpkins to keep in my garage so that I could make this for a few more months. I really recommend trying this. Which size can of pumpkin? Could I substitute soy milk? We have a nut allergy and lactose intolerance in our family. Thanks! I’m just curious here but….what kind of pumpkins do you use to make your purée? Do you get those little sugar baby varieties or the jack o lantern type they sell everywhere this time of year? Can’t wait to try this recipe. Looks yummy. Is 1 pie pumpkin enough for this recipe? How do I puree it in my vitamix? I know that’s probably a silly question. Making cashew milk at home is actually quite easy. First, you must soak the cashews for about 4 hours. Then blend them up in a blender with 4 cups of water (add some sweeteners or flavorings if you want) and that’s it! You don’t have to sift, strain or anything. It’s so delicious!! I was wondering if you used the water that the cashews were soaking in or 4 C. fresh water. Hi Selma – I use 4 cups of fresh (filtered) water. I rinse the cashews after they have been soaked and then add them to the blender with 4 cups of water. This will give you the consistency of probably 2% milk. Add more water for even thinner. I am really in the mood for soup today too. I have a quart of stock in the fridge that has been defrosted, but now I am craving this one.